Red Pineapple are bromeliads, herbaceous perennials, some growing to 4 feet in the warmest parts of Florida. Most pineapple varieties have striped leaves with small but sharp spines along all of the edges. They grow in clumps. The fruit grows from the center of mature pieces. Native to Tropical America in southern Brazil, pineapples are popular in the landscape both for their foliage and the appearance of fruit. Ananas comosus 'variegatus' is more popular than the green for ornamental purposes. 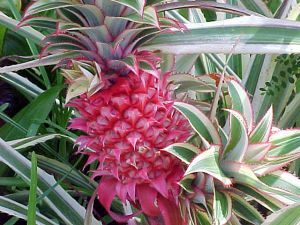 Also, the pink pineapple is sought for its foliage and pink fruits adding tropical atmosphere wherever they are planted. One of the best ways to prevent hypertension is to eat foods that have a high amount of potassium. If you want to lower blood pressure, try to consume a cup of pineapple because it contains about 1 mg sodium and 195 mg potassium. The natural sweetness of the pineapple will make you always feel full. People with diabetes do not need to worry because the content is a little sugar on the pineapple. Pineapple is one source of vitamin C is very good. Vitamin C can protect our bodies from free radicals that attack the cells of our body immune. Preventing the flu and encourage our immune system to be more robust in the face of the virus and the statement. Pineapple also contains enzymes that make skin elastic and able to remove the skin cells are damaged and replaced with new ones. In addition to health benefits of pineapple has penetrated into the world of beauty. If you are diligent in taking the pineapple will be able to reduce age spots and fine lines on the skin.